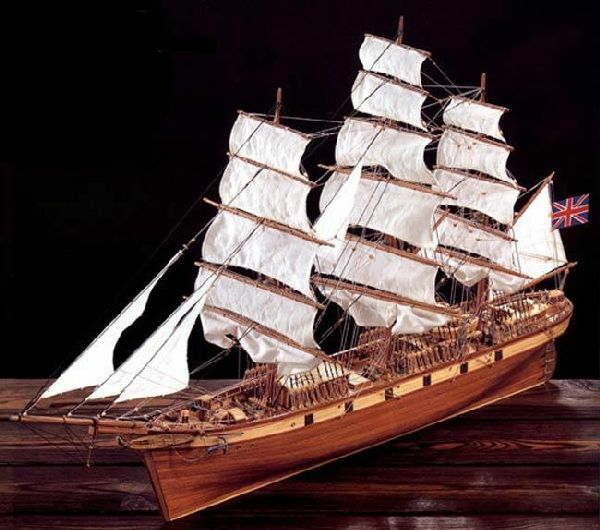 This is the 1/115 scale wooden model kit of the Cutty Sark from Constructo. This Chinese tea clipper was launched on November 22, 1869 at the Dumbarton Shipyards on the river Clyde in Scotland. Today she is berthed in dry dock at the Naval Museum in Greenwich England. Multiple die cut sheets of wood, four different colors and thicknesses of rigging thread. INCLUDES:Color picture manual, sail diagram sheet, four plan sheets, all wood to build model, sail material, rigging thread, metal chains and deck fittings.